Femme by Boss. Radiant. Soft. Smooth. Femme by Boss exudes an aura of captivating femininity. The subtle, lingering warmth of the fragrance is sublimely sophisticated and modern. An enticing experience and the most liberatingly feminine fragrance from Boss. 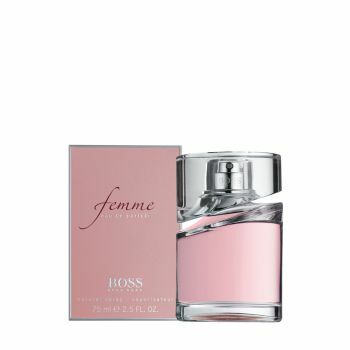 Femme by Boss is harmony in a bottle; a scent metaphor for modern femininity. Projected by the fruity top notes of tangerine and blackcurrant, the fragrance is grounded in a creamy, musk-like base. This works with the white floral trio of stephanotis, rose and oriental lily to leave behind just a subtle, warm aura of the scent.